Say Paw made her first-ever trip to a dentist in March. It was not an upbeat visit. A Karen refugee from Myanmar, Paw, 36, lost two front teeth in an accident 18 years ago. She had used only charcoal and salt to clean her teeth before coming to the United States in January. 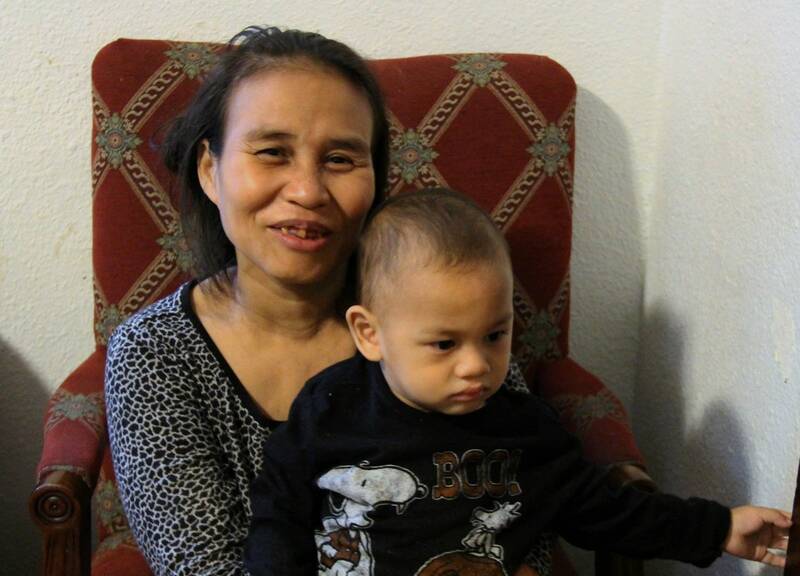 Chewing betel nuts for the past two years, a common practice back home, had worsened her oral hygiene problems. The dentist told her that all her teeth needed to be pulled. "I'm so scared that if I go back to see my dentist, he is planning to remove my teeth," she said. "I don't want to go back." It's a story Minnesota refugee advocates say they hear all too often. Cultural practices, resettlement struggles and the challenge of finding dentists willing to take Medicaid make good oral hygiene extremely hard for many refugees. Medical experts say tooth and gum decay is a serious issue that can lead to future health problems, from digestive struggles to diabetes and heart disease. Most refugees, though, had never been to a dentist before immigrating, said Micaela Schuneman, director of Refugee Services at the International Institute of Minnesota. "It can be kind of scary," said Schuneman. "A lot of our clients have lived in refugee camps before they come here. They may not have had access to toothpaste and even fresh water all the time to wash out your teeth." The challenges of seeking medical care start early. When refugees arrive, they apply either for the state's Medicaid program, known as Medical Assistance, or for federal Refugee Medical Assistance if they aren't eligible for the state program. Benefits are the same. But having the insurance does not guarantee that they can get needed dental services. Not all medical providers in Minnesota accept clients with the state and federal health insurance. The situation is more challenging when it comes to dental services, said Julie Marquardt, director of health care purchasing and service delivery at the Minnesota Department of Human Services. While dentists in the seven-county metro area are required to have at least 10 percent of their patients be Medical Assistance enrollees in order to gain access to clients from other state-sponsored health care plans, there is no such requirement for dentists in greater Minnesota. That means Medical Assistance patients outside the metro area who need dental work may not get it, Marquardt said. The main reason that many dentists would not want to see Medical Assistance clients is the low base rates for dental services, said Dr. Brad McDonnell, a dentist and dental director at West Side Community Health Services in St. Paul. A 2016 American Dental Association study found that a state Medicaid program like Minnesota's Medical Assistance has significantly low reimbursement rates for dental services compared to private dental insurances. For example, for a teeth cleaning service for adults that costs $100, a dentist would only get about $37 under a state Medicaid program while a private sector plan would reimburse $79 for the same service. Most of the dental service rates for Medical Assistance have stayed the same or have not been meaningfully increased for more than 20 years, according to a 2015 Department of Human Services report. "This is bread-and-butter type stuff, bread-and-butter dentistry," said McDonnell, who has been serving low-income patients including immigrants and refugees for more than 40 years. These new Americans who need oral care often have to either wait or switch to other, potentially more expensive healthcare options such as UCare and Blue Plus that provide a Prepaid Medical Assistance Plan for low-income clients. "If clients need dental care prior to a Prepaid Medical Assistance Plan being active, we call around and look for dentists willing to work with the Medical Assistance" program, said Michelle Eberhard, director of Refugee Arrival Services at Arrive Ministries in Richfield. "If it's an emergency we would possibly have to rely on donations to our organization to pay out of pocket for care." Once a refugee sets foot in the United States and is referred to Minnesota, he or she has a maximum of 90 days to receive essential resettlement services from a local agency through federally-funded programs. Six refugee resettlement agencies in Minnesota assist refugees with getting necessary medical services like mandatory health screenings. They also offer cultural orientations. But for many refugees, three months is not enough time to fully prep themselves to live in a new country. It's typical for clients to wait longer than the 90 days to see a dentist, said Kristina Hammell, director of refugee resettlement at Catholic Charities of Southern Minnesota in Rochester. "We try to send them reminders or give them a call prior to their appointment," Hammell said. "If they missed this one, that means that they may have to wait even more months till the next one opening is available to them." It also can be too overwhelming for them to absorb what they learn about the new culture within such a short amount of time, Schuneman said. "Most of our clients arriving in the U.S. were not seeing a dentist, at least not with our assistance, because there were so many other things that needed to happen in 90 days," said Schuneman. In response, the institute started the New American Healthcare Initiative three years ago, to provide refugees six months of medical case management services to enable each to make connections with medical providers. The initiative is limited to 263 enrollees a year who are referred to the institute. In previous years, the capacity was not enough to cover all the refugees it helped resettle, leaving tens of the others unassisted after the 90-day period. American bureaucracy isn't the only challenge to good oral hygiene. Practices and customs refugees bring with them can also create problems. 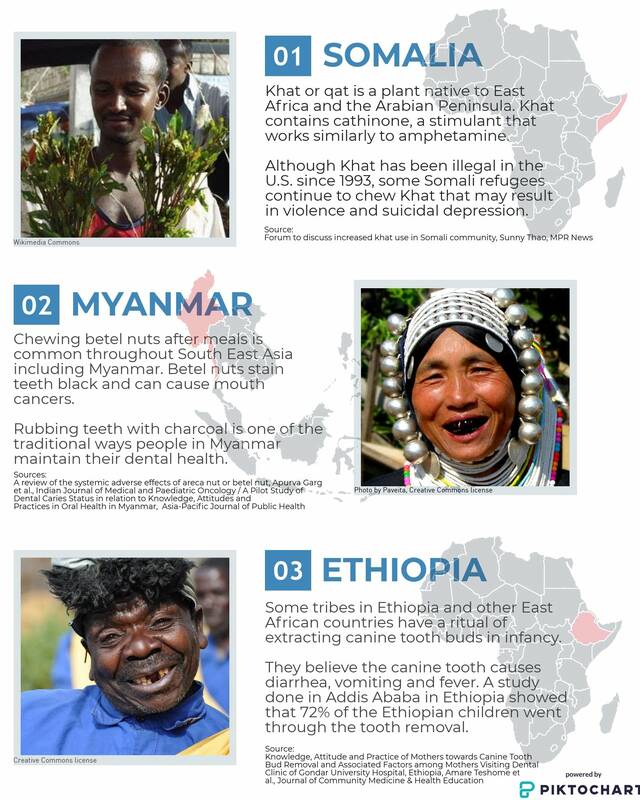 The Somali tradition of chewing of khat leaves, banned because khat's active ingredient is considered an amphetamine, is also a problem for oral hygiene. Ethiopian immigrants brought with them a custom of removing baby canine tooth buds from infants between ages 4 to 18 months. "Those are some of the things that might have negatively impacted someone's oral health before they come to the U.S. and it may still be an issue once they're here," Schuneman said. Paw also chews betel nuts, a fruit from a palm tree that leaves black stains on teeth. It's a practice she picked up while living in a refugee camp in Thailand. She said she now buys the highly-addictive nuts from local stores. While they're not illegal, some studies have found the nuts can cause mouth cancers. While language and other barriers are difficult for many refugees, it's this kind of custom that can be hardest to overcome. "It's from my mom, grandma, grandpa who used to eat [betel nuts]," Paw said. "It's only for the tradition."